The Compass and Patriot are both based on the DaimlerChrysler/Mitsubishi GS platform. These vehicles are differentiated by their styling and marketing: The Patriot is a traditionally styled 4-door Jeep wagon, while the Compass has a softer hatchback look, similar to the Dodge Caliber. For 2011, Jeep redesigned the Compass to more closely resemble the Grand Cherokee, while keeping its own identity. The 2011 Jeep Compass also receives a revised suspension for better handling, a revised interior with more standard equipment, and more option packages including a Freedom Drive II Off-Road Package which includes a continuously variable transmission fitted with a low-range setting, all-terrain tires inside 17-inch aluminum wheels, skid plates, a four-wheel-drive system, and an increase ground clearance of a full inch. A special edition Compass model commemorated Jeep’s 70th anniversary in 2011, and included various upgrades, special interiors, badges, wheels, and was available in only three exterior colors: Bronze Star, Bright Silver, and Black. The Compass uses a 172 hp (128 kW) 2.4 L World I4 gasoline engine. The 2.0 L World engine is available on the 4X2 Sport model with 158 hp (118 kW). A 2.0 L l-R4 TDi 103 kW (138 hp; 140 PS) Volkswagen-designed diesel engine was available for the European and Australian markets, replaced in 2011 by the 2.2 L Mercedes-Benz OM651. The Compass also features two electronically controlled four-wheel drive systems. Freedom Drive I and Freedom Drive II, Freedom Drive I is a full-time four-wheel drive system with locking capabilities; Freedom Drive II is based on Freedom Drive I but by using the vehicle's CVT transmission it is capable of a 19:1 gear reduction simulating a low-range usually found in vehicles with dedicated transfer cases. The base model version has front wheel drive (FWD). The Trail Rated version of the Compass has passed the same testing of off-road ability as other Jeep vehicles in terms of traction, ground clearance, maneuverability, articulation, and water fording. The three basic models of Compass are Sport, Latitude, and Limited. The Sport serves as the base model. It includes features such as seventeen-inch alloy wheels, an AM/FM stereo with single-disc CD player and four speakers, a heater, cloth seating surfaces, and manual, roll-up windows and manual door locks. Features such as power windows and door locks, a seven-speaker Boston Acoustics premium sound system with a 368-watt external amplifier, and air conditioning are options. The 2014-2016 Jeep Compass Sport and Sport SE, The Electronic Vehicle Information Center (EVIC) does not come as standard equipment. An EVIC gives the user information such as gas mileage, number of miles to empty, service intervals, tire pressure, etc. The Latitude is the midrange model. It added features onto the Sport, such as air conditioning, keyless entry, a security system, and power windows and door locks. The EVIC comes as an optional component with the security and cargo convenience package. This option comes with alarm, tonneau cover, tire pressure monitoring display, garage door opener, and electronic vehicle information center. The model became available in 2011. The Limited is the top-of-the-line model. It added features such as leather-trimmed seats, had an available sunroof, and remote starter. A 70th Anniversary Edition was based on the Sport model. It added air conditioning, unique leather-trimmed seats, unique alloy wheels, a sunroof, side-impact airbags, a seven-speaker Boston Acoustics premium sound system with a 368-watt external amplifier, power windows and door locks, keyless entry, and a security alarm. This special edition model was only offered in 2011 to celebrate Jeep's 70th anniversary. All Jeep models for 2011 only offered a 70th Anniversary Edition model (Compass, Patriot, Wrangler, Wrangler Unlimited, Liberty, and the Grand Cherokee). An Altitude Edition model was made available in 2012. It was based upon the Latitude model, and added black-painted alloy wheels, leather-trimmed seats, a sunroof, and a Boston Acoustics premium sound system with a 368-watt external amplifier. The Altitude package was available on the Jeep Grand Cherokee only at first, but then was available on the Compass, Patriot, Wrangler, and Wrangler Unlimited as well. All models except the Jeep Grand Cherokee dropped this model (the Grand Cherokee model continued to offer this model for the 2013 model year). The Altitude name was chosen in a contest to name a Grand Cherokee concept car. Because of the Altitude's popularity, Jeep decided to offer it on all models except for the Jeep Liberty. The Jeep Patriot and first generation Jeep Compass were phased out during the 2016 model year, replaced by a single new redesigned Compass SUV that FiatChrysler would debut in late 2016. The Compass was safety tested by Euro NCAP in 2012 and earned only a two star rating. The second-generation of Jeep Compass debuted on September 27, 2016 in Brazil and at the Los Angeles International Auto Show in November 2016, replacing the Jeep Patriot and first generation Compass. Using a stretched version of the same platform as the Renegade, the Compass is available in four distinct trim levels: the base Sport, the mid-level Latitude, the luxurious Limited, and the off road-capable Trailhawk. All trim levels are available with either front-wheel drive or four-wheel drive, with the exception of the Trailhawk, which is only available in a 4WD configuration. In the United States, the Compass comes equipped with a 2.4L Tigershark four-cylinder engine. More than 65 percent of the upper body structure and frame is made of high-strength steel. Available features include FCA's UConnect 4C 8.4 and 8.4N touch-screen infotainment systems, a Beats Premium Audio System with a 506-watt digital amplifier, eighteen-inch aluminum alloy wheels, Jeep's Command-View panoramic sunroof, LED front headlamps, Forward Collision Warning, a ParkView rear-view backup camera system, front and rear parking sensors, Blind Spot Information System (BLIS), and Jeep's Selec-Terrain full-time four-wheel-drive system (standard on the Trailhawk model). The Jeep Compass was unveiled in India on 12 April 2017 and assembled in the FCA India Pune plant since 1 July 2017. Apart from manufacturing to the Indian market, Jeep also exports the made in India Compass to many right-hand drive markets such as the United Kingdom, Australia, Brunei, Japan and Thailand. The India-spec model is available with two engine options - a 1.4-litre, four-cylinder, turbocharged MultiAir petrol and a 2.0-litre, four-cylinder, turbocharged MultiJet II diesel engine. In 2017 Jeep sold about 10,000 Compasses in India from the day of release until the middle of December. The Jeep brand manufactured by GAC-FCA will launch 2019 Jeep Compass in China mainland. The new Jeep Compass will be launched in mid-April 2019, it is expected to be announced at the Shanghai Auto Show on April 16th 2019. According to the information from China MIIT(Ministry of Industry and Information Technology), 2019 Jeep Compass China-spec will have a four-cylinder turbocharged engine with displacement of 1332mL. The Compass is assembled at plants in Mexico, Brazil, China and India. North American and European models are manufactured in Toluca, Mexico; moved from Belvidere, Illinois. In Brazil, the second-generation Jeep Compass start production the 26 September 2016 at FCA new Goiana, Pernambuco Assembly Plant. Production of the first-generation Compass and Patriot ended early 2017, with production of the second generation Compass beginning in spring of 2017 for North American models. Assembled at Fiat's facility in Ranjangaon, Maharashtra, it is Jeep's first model assembled in India. ^ "Jeep Compass concept vehicle". www.ultimatecarpage.com. Retrieved 25 March 2012. ^ Kranz, Rick (13 June 2005). "Jeep will reportedly build two car-based vehicles". AutoWeek. Retrieved 23 June 2014. ^ Nagy, Chris (14 December 2010). "Jeep Resets Compass on New Course in 2011". Automoblog.net. Retrieved 23 June 2014. ^ Kirby (1 November 2011). "2011 Jeep Compass 70th Anniversary Edition". www.topspeed.com. Retrieved 23 June 2014. ^ McCraw, Jim (12 April 2006). "The First Front-Wheel-Drive Jeep". The New York Times. Retrieved 23 June 2014. ^ "It's Official: Jeep Wrangler Pickup Is Coming in 2017". blog.caranddriver.com. Retrieved 13 January 2016. ^ "Jeep confirms pickup; new SUV to be Patriot or Compass". Detroit News. Retrieved 13 January 2016. ^ "2012 Jeep Compass". euroncap.com. Retrieved 25 October 2015. ^ "Euro NCAP results for Jeep Compass" (PDF). euroncap.com. 2012. ^ "2013 Jeep Compass SUV 4WD". Safercar.gov. Retrieved 23 June 2014. ^ "All new Jeep Compass makes worldwide debut in Brazil". Jeep Press Europe. 27 September 2016. Retrieved 30 July 2018. ^ "Jeep Compass SUV to be launched in June in India". Ibtimes.co.in. 18 January 2017. Retrieved 25 February 2017. ^ "Jeep Compass: a new direction for the SUV segment". FCA Press. 26 September 2016. Retrieved 30 July 2018. ^ "Jeep Compass (2017) - pictures, information & specs". Netcarshow.com. Retrieved 25 February 2017. ^ "2017 Jeep Compass". Autoblog. ^ 2016 LA Auto Show: 2017 Jeep Compass Promises Improved Ride and Performance. trucks.com. ^ "Jeep Compass India specifications, features, expected price and launch date details". Autosite India. 12 April 2017. Retrieved 16 April 2017. ^ by സ്വന്തം ലേഖകൻ. "Jeep Compass India". Manoramaonline.com. Retrieved 7 July 2017. ^ "Jeep to Launch 2019 Compass in China Market". ChinaCarNews. 4 April 2019. Retrieved 8 April 2019. ^ FCA to build Jeep Compass in four plants globally. Detroit Free Press. ^ "Jeep Compass India debut on April 12". Autocar India. Retrieved 9 April 2017. ^ "'Made-in-India' Jeep Compass to debut on April 12, video teaser released". Hindustan Times. 8 April 2017. Retrieved 9 April 2017. ^ "Jeep Compass" (PDF). euroncap.com. Retrieved 6 August 2017. ^ "Vehicle details". Iihs.org. Retrieved 17 October 2017. ^ a b "Total Chrysler LLC December 2007 Sales Up 1 Percent on the Strength of Retail". CheersandGears.com. 15 March 2010. Retrieved 23 June 2014. ^ "December 2008 Sales: Chrysler LLC". CheersandGears.com. 5 January 2009. Retrieved 23 June 2014. ^ "Chrysler Group LLC December 2009 Sales". CheersandGears.com. 5 January 2010. Retrieved 23 June 2014. ^ "Chrysler Group LLC December 2010 Sales". CheersandGears.com. 3 January 2011. Retrieved 23 June 2014. ^ "Chrysler Group LLC December 2011". Retrieved 23 June 2014. 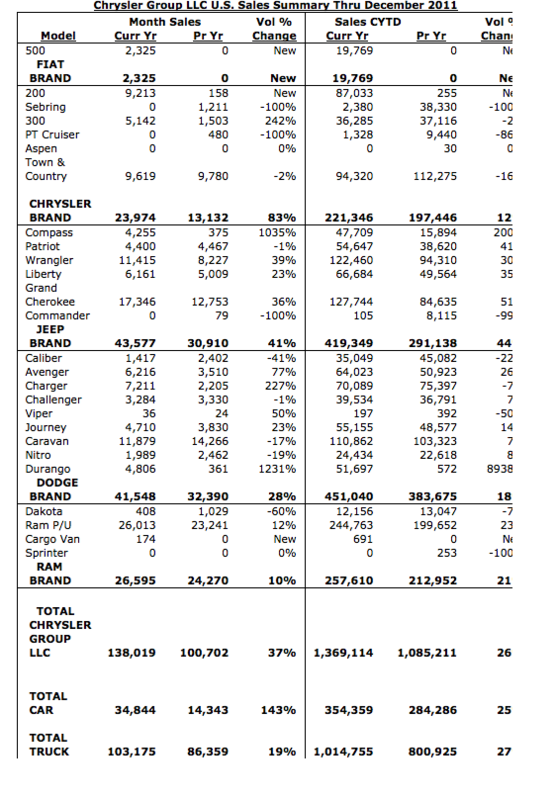 ^ "Chrysler Group LLC Reports December 2012 U.S. Sales Increased 10 Percent" (Press release). Chrysler Group LLC. 3 January 2013. Retrieved 23 June 2014. ^ a b "Jeep Brand Records New All-time Global Sales Record in 2013" (Press release). Chrysler Group. Retrieved 23 June 2014. ^ "Jeep® Brand Records Fourth Consecutive Global Sales Record" (Press release). Fiat Chrysler Automobiles N.V. Retrieved 5 January 2016. ^ "FCA USA (FCA US Reports 2016 December and Full-year U.S. Sales)". Fcanorthamerica.com. 4 January 2017. Retrieved 7 July 2017. ^ "FCA Canada (Sales Canada 2016)". Fcanorthamerica.com. 4 January 2017. Retrieved 7 July 2017. ^ "Jeep Compass Sales Figures -". 2 January 2011. Retrieved 16 July 2018. ^ "FCA USA (FCA US Reports April 2017 Sales)". Fcanorthamerica.com. 2 May 2017. Retrieved 7 July 2017. Wikimedia Commons has media related to Jeep Compass.